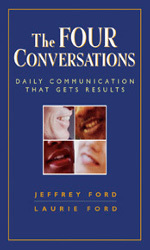 The Four Conversations demonstrates how to use the right conversation at the right time—planning and starting each one well, and finishing every conversation effectively—to produce the results we want and the improved productivity our organizations need. Winner of the Best Management Book of 2009 from 800 CEO READ. Jeffrey Ford and Laurie Ford are, both literally and figuratively, a marriage of theory and practice. Jeffrey is an associate professor of management in the Max M. Fisher College of Business at The Ohio State University in Columbus, Ohio. Laurie, with a Ph.D. in engineering, is a professional speaker, trainer, and management consultant. Together, Jeff and Laurie have served as educators and consultants to scores of businesses, government agencies, and not-for-profit organizations, including Intel, NASA, JP Morgan Chase, the U.S. Department of Energy, and the Ohio Hospital Association. They are authors of numerous articles for academic and professional management journals, including the Harvard Business Review. Their collaboration provides a unique approach to making management easier, organization change less painful, and collaboration less stressful. How can you tell if someone is engaged in leading? This question has been the subject of extensive debate by academics and practitioners alike. A key factor that separates someone who is leading from someone who is not is their use of initiative conversations. You must be a Member to view this Knol.